Below is an exclusive CollegeTimes interview with Charles Brumfield, a former lecturer at Webster University : Thailand with a PhD in Economics who has spent over 25 years of his life traveling and teaching at universities across the United States, Europe, Asia, and Africa. Dr. Brumfield is one of dozens of faculty members from the WUT campus who claim they have been treated wrongfully (illegally) by the school, and despite being threatened by current administrators for speaking out, he made the decision to come forward as a public voice of dissent against ongoing corruption and fraud within Webster University’s international system. He still lives in Thailand, where he has been offered protection from WUT administrators by the Royal Thai police. The below interview has been combined with quotations (shown in gray) from a series of emails that Dr. Brumfield sent to a private group of former and current WUT faculty members; much of the email content has been re-arranged in accordance with the flow of the interview. 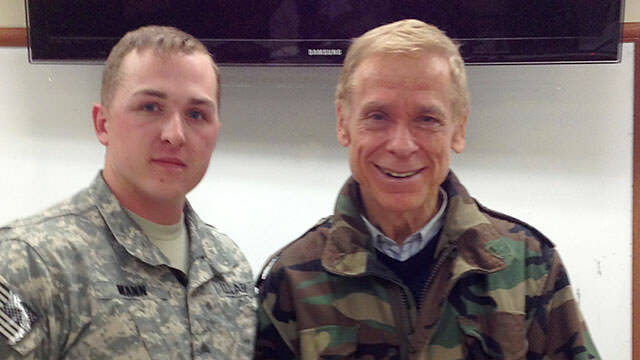 PHOTO: Dr. Brumfield poses with U.S. Army Sgt. Evan Mann in a Department of Defense classroom at Camp Casey, Korea – near the DMZ – while teaching on behalf of the University of Maryland in 2013. 1. How did you first come to begin lecturing at Webster University Thailand? When did you start, how were you recruited, and what were the terms of your contract? What is your academic background/qualifications? Further, why did you decide on living and/or teaching in Thailand, of all places? I was teaching for the University of Maryland in Singapore when I first applied to Webster in late spring 2001. I was engaged to be married to a Thai woman and wanted to live in Thailand (still married to her, 15 years in February). I already had one job lined up, i.e., continuing to teach for the University of Maryland at the American embassy. [Then-WUT Director] Brad Keith said I could work for both WUT and the University of Maryland. The University of Maryland offered their courses on weeknights and Brad said they would schedule my graduate courses on weekends, which he did. I also taught on weeknights in the MBA program at Naresuan University (in conjunction with Bangkok University and the Australian universities Queensland University and Southern Cross University). I left WUT and Thailand [in 2002] after one year because I thought WUT was a terrible place to work and the University of Maryland offered me 5 times as much money to teach 2 courses in Japan as I was making teaching 5 courses for three schools in Thailand. Shortly after I left, the only other Ph.D. on the WUT MBA faculty (Ph.D. Cambridge University) resigned also. This left only Masters degrees teaching Masters candidates, same as now… by January  student enrollments at WUT had dropped from around 500 to just under 160. WUT had to be bailed out by WUSTL and began a slow climb toward its former level of deception. It never fully recovered its student numbers. In 2014 I retired — after 25 (nonconsecutive) years with the University of Maryland, I decided to retire to Thailand. I had plenty of money coming in, so I didn’t have to work. But I wanted to keep my hands in teaching to keep my mind sharp. On the suggestion and encouragement of some WUT insiders that they were “desperate” for good teachers, I reapplied to WUT and got the job under a “B contract” requiring me to teach 5 courses in 10 months for ฿481,000 THB. To see my credentials, please see the attached vita. I was hired in May 2014 after an ad hoc 30-minute interview by [Then-WUT Interim Head of School of Business and Technology, Roy Avecilla] and [Then-WUT MBA Program Coordinator, Ramona Mihaela-Paun] at Starbucks. I revealed to them during the interview the troubles I had while teaching in the MBA program at WUT in 2001-02 (at the same time that I was teaching at two other universities in Bangkok with outstanding reputations). I was singled out [back then] for harassment by the interim WUT director who was sent over from Austria to try to bring administrative corruption under control. Shortly after our meeting I received their offer with three options. Option A was fulltime which required a lot more work while offering little more in compensation. Option C was adjunct at almost no pay and very little to guarantee courses. Option B seemed to be the best way to go, with a contract guarantee of 5 courses, which for me were offered as MBA courses in Economics and Finance, both subjects I had taught many times before, both graduate and undergraduate. I didn’t even ask about the pay. With my money, it was of little concern to me… My contract was only ฿481,000 THB to be paid over 10 months at ฿48,000 THB a month. (That amounts to about $1,500/month, or about half of what is considered to be the poverty level in the USA. One can’t even live in Thailand on that!) Anyone who thinks I signed up with WUT for the money is insane. 2. From my understanding, you were “dismissed” from Webster University Thailand in December of 2014, is that correct? From what you were told by WUT administrators, and from your own personal conclusions, what was the reasoning behind the severed contract? Yes, I was “dismissed”. The MBA Program Coordinator [Ramona Mihaela-Paun, now the new Head of WUT School of Business and Technology as of January 2014] told me it was because I got a student complaint that I’m a “terrible” teacher after one and a half class meetings… [but] I believe it was because [Mihaela-Paun] was jealous of what I wonderful life I have led (and continue to lead), and subconsciously she resented that because her life is miserable… just my take. Beginning in August , I was assigned to teach one undergraduate class at the Bangkok center, and then I would begin teaching two graduate classes in my specialties in Graduate Fall Term 2. In the first week of my graduate classes, I taught [a half-full] Economics class on Monday because of an administrative screw-up in telling most of the students the class started on Wednesday. The Finance class was canceled with only three students because [Miahela-Paun] expelled one of the four students in the class for what seemed like a bizarre reason to me, really no reason at all (allegedly for turning in a project in her class a day late the previous term because his computer crashed… she gave him an ‘F’ in the class). The student begged me to help him stay in school, but what could I do? I was instructed to mind my own business, which I did. He was on the next plane out of Thailand. On Thursday morning I woke up to an email from [Miahela-Paun] saying she and [Avecilla] wanted to meet with me on Friday morning (remember this is still the first week of the term). I went to the meeting in good spirits honestly thinking they were going to offer me an administrative position. The first thing [Miahela-Paun] said was that she was canceling the Finance class and removing me from the Economics class. I was shocked! I asked, “Why on Earth! ?” She read one complaint from her iPhone calling me a “terrible teacher” and claiming the student said he “wasn’t learning anything.” After one and a half meetings! If the email wasn’t fabricated, it obviously was written by an ignorant, cowardly student who thinks he knows more how to teach an economics class than a professor who has been doing so for over 40 years with a stellar teaching record and reputation (e.g., University of Maryland Excellence in Teaching Award, Spring 2014). She revealed the student’s name, and it’s hard to believe he wrote the complaint because he was so complimentary to my face. [Miahela-Paun] said, “We can’t have student complaints if we are to make the MBA program succeed.” In other words, “do whatever it takes to keep the students from complaining” – a pattern I found ubiquitous at WUT… no waves, whatever it takes to keep the waters calm… “let the students decide” what is to be taught and how it is to be taught. She replaced me with a teacher totally unqualified to teach graduate economics… [Avecilla] said I was not being “fired from WUT” but only from the graduate program. This “terrible” teacher could continue to teach undergraduate courses under my contract; still it was an insulting demotion, and obviously he was being deceptive with me because he and I both knew I would be terminated after finishing the one undergrad class I was teaching. [He] seemed to realize that [Miahela-Paun] was making a terrifically damaging mistake, but he said he had “no control” over the MBA program, [even being the Head of WUT’s School of Business and Technology], and had to defer to her. Why? “There’s nothing I can do. It’s out of my hands.” In the far distant future, I hope, maybe those words should be his epitaph, he says them so often. 3. Surely dismissals of faculty at an “American university” are not so arbitrary as you describe – or are they? Ironically, I was also “dismissed” from the WUT campus allegedly for not holding a PhD degree in web design (the elective course that I instructed). There are several other recent “dismissals” or similar at WUT, that don’t seem to follow Thai labor law, let alone the contractual terms set out by WUT, let alone common traditions in the academic community. Can you comment more on this? I am not an authority on Thai labor law, but from what I’m told by my Thai attorney, WUT administrators appear to be violating just about every law on the books. I’m still working on a 100 million baht lawsuit against WUT for defamation, gender bias and discrimination, fraud, libel, slander, wrongful termination, loss of income, intentional infliction of stress and mental anguish, and two separate 10 million baht lawsuits against individuals for defamation. The preparation of these legal actions is taking more time than I anticipated in coordinating the Thai and US systems, but they will be forthcoming. I may never get a baht out of these lawsuits, which will cost me around 200,000 baht to pursue, but my intention is not to enrich myself (believe me, I have plenty of money, hidden away and protected in safe harbors around the world). I want the publicity surrounding these lawsuits to call maximum attention to the incompetence, fraud and deceptions, and outright arrogant foolishness of the current WUT administration. I want them to get the message loud and clear that they simply cannot continue to get away with what they have been doing. If nothing else, they are grossly violating every basic standard of human dignity and academic ethics. I’m doing all I can to reveal and stop the deception. A few other current or former faculty are pursuing their own actions. The remainder are too afraid to stand up and be counted. They would rather live with incompetence and fraud than “man up” and try to get rid of these corrupt administrators and restore WUT to an ethical quality institution of higher learning. They are afraid of losing jobs that they are going to lose anyway because of their refusal to take a stand. 4. On 23 December, 2014 you sent an email out to current and some former instructors at WUT announcing your sudden (unsigned) termination letter. You mentioned never having received Faculty and Teaching Policy Handbook 2004, WUT Employment Policies and Procedures 2011, among other key documents referred to in employment contracts and elsewhere – a common claim among several WUT instructors. In addition you claim that student evaluation results – neither specific, nor summary results – were ever shared with you (another common claim) even despite your “termination” being based off a supposed negative review submitted to WUT by one of your students. To date, has anyone from Webster University confirmed to you who made the final decision regarding your dismissal, provided statistics re: discipline of faculty, or fully justified why such action was taken? The answer to all your questions is “NO”. I have never received any of the documents you mentioned. I saw summarized results of my mid-term evaluations, without explanation, in a clandestine meeting with [Avecilla] at a coffee shop. I never saw any other evaluation results, including Lee Tao Dana’s (Peer Faculty Evaluation) visitation results. The Head of WUT’s School of Business and Technology told me my midterm evaluations were slightly “below average” but wouldn’t let me see them, only poorly explained summary results… [but] I wasn’t surprised by the results because I detected that the students were expecting a level of teaching that I hoped I would not have to stoop to. They had become used to a way of teaching that can hardly be called teaching. 5. Considering the bigger picture for a moment, why do you think a school like WUT has such a shockingly high turnover rate of faculty and support staff (from both “dismissals” and also resignations)? During a July 2014 faculty meeting, Rector Ratish Thakur claimed it was primarily due to the campus location, and the fact that Webster University in St. Louis had “refused” to contribute funding to WUT, etc – but is there reason to believe its perhaps a strategic move by the administration to keep employees “fresh and clueless” to ongoing scandals and problems? I think one reason is the very low salaries and the poor working conditions at Cha-Am. But I think the major reason for their bizarre behavior is their fear that someone will expose what they’re up to. Yes, keep the faculty “fresh and clueless” and there is no one to report their criminal behavior. Anyone who might pose even a slight threat is simply eliminated. Thus, WUT is left with a cowering faculty who will not stand up to their bullying. In my opinion Webster is violating every moral tenet of higher education and should not continue to get away with it. Again, in my opinion, I sincerely believe Webster University Thailand will be out of business by summer. It didn’t have to be like this. All that has happened or is about to happen to Webster University really is quite bizarre. I am very happy in Thailand and will be just fine in spite of WUT’s unwarranted, very foolish, premature termination of my contract with them. I have never had a contract or any job terminated in my life, and I have always been lauded for my work and always offered a new contract. We who have been so grievously treated by the WUT administration have about 20 or 25 insiders helping us out. They can’t fire everybody on fabricated charges and expect to keep the institution going. If we all stand with a solid front, we can get the corruption and incompetency out of WUT and make it a much better institution of higher learning. 6. Since WUT was first established back in 1999, there has been a seemingly continuous amount of scandals – whether bizarre hirings, to dramatic firings, to suspicious recruiting practices, and beyond. In one email, quoted below, you mention that during the 2001-2002 academic year, WUT went through, astoundingly, five different directors. As one of the only people able and willing to publicly recall the turbulent history of the WUT campus, could you summarize as briefly as possible what forces have kept WUT in existence, and why those forces seem to be so desperate to keep WUT alive? WUT went through a similar conflict between faculty and administration back in 2001-02, during which the university went through 5 directors in one year. The Ph.D.s on its faculty (including one very prominent Ph.D. from Cambridge University) walked away in protest to the terrible administrative job going on, leaving WUT with only Masters degrees teaching in its MBA program, and within the next year enrollments dropped from near 500 to less than 160. Yet St. Louis bailed WUT out at great losses, and it slowly recovered under somewhat better administrations. Now WUT is drifting back into that wounded bear condition that may ultimately lead to its demise… Will WUT turn around? It has never had much respect anywhere anyway. To gain respect it must employ a staff that will work to increase it’s quality and status and stop the lying, deception and fraud. To find a competent staff, it must increase its pay scale, which may mean increased tuition, which may drive away some of its students. WUT is caught in a “Catch 22”, damned if it does and damned if it doesn’t. WUT needs increased support from Webster St. Louis if it is to survive, and I don’t think that support is forthcoming this time. It also needs a complete sweep of the current admin and a concerted effort to recruit good, honest, concerned people to replace them. Believe it or not, some of us ex-WUTers who have been getting together on a regular basis recently have discussed this very question. Why is Webster keeping its Ghana program alive for 6 students when they are losing (according to one inside source) $20 million per year on it? Probable answer: They want the prestige of being called an international university with campuses on 4 continents. That’s understandable. But the problem with that is, when your international program is a sham, it becomes the laughing stock of the international academic community. An international university with campuses around the world is very prestigious if you’re offering quality programs like the University of Maryland does. If you’re running a shoddy program, all respect goes down the drain. All your efforts are for naught. If you are hiring people with great credentials which certainly would make your program look good if nothing else, and then you fire them after a couple of months, you can’t be taken seriously as a quality program. Why would anyone do that? It’s bizarre to the extent of being almost insane, as far as WUT is concerned. If you run your program based on fear, intimidation, deception, and fraud, how can your program be taken seriously? You need Ph.Ds on a graduate program. I know there are many very good professors, even at WUT, who have only Masters degrees. I have said many times: You don’t have to have a Ph.D. to be a good teacher. But, the academic community thinks you do. I taught many undergraduate classes with only a Masters degree, but never a graduate class. After earning my Ph.D. and teaching graduate classes, I realized that in no way was I qualified to teach a graduate class with only my Masters. There’s no way I would have done a quality job. It would have been a mockery. So, in answer to your question, Webster seems to be trying to hard to achieve mediocrity. They want to be prestigious, but the academic community is thinking otherwise based on shoddy programs administered poorly. 7. It is widely known among the greater WUT community that during the fall of 2014, Webster’s St. Louis campus sent a so-called “Campus Review” team on multiple visits to “review” what needed to be improved at WUT. To my knowledge, this was the first such organized trip in WUT history, is that accurate to your knowledge? Moreover, why do you think the trip was so bizarrely secretive to the point of most faculty and students not even knowing about it, let alone being invited to share feedback with St. Louis? Doesn’t this guise of a “review” in and of itself prove that St. Louis is just as much, if not more so, to blame for the scandalous reputation that WUT has? I’ll just say, I think your question best answers itself. That is, I agree with everything you say in the question and I cannot say it better. To my knowledge investigative committees of this sort have never been sent over before. Everyone tells me that. But I think it’s important to emphasize – as I have many times before – the committees they send over are being whitewashed. They are wined and dined by the people they are supposed to be investigating, in a lovely exotic tropical atmosphere, and then they go home and write glowing reports. They never talk to the faculty or students because they think all they’ll do is whine and what they have to say is not important anyway. That’s always been the way administrations have looked at faculty and students… as disposable. If reports are made available to the general public, they will have been edited by the upper administration at St. Louis to say exactly what the admin wants them to say. But I have serious doubts that committee reports ever will be released to the general Webster community. Why would they see a need to? Nobody really cares. It’s all window dressing… a farce. If the reports ever are released, they will be whitewashed and show nothing but lollipops and roses. By the way, I’ve served on some pretty important committees at some big universities (e.g., Appropriations), and it’s pretty much the same everywhere. Committees say what administrations want them to say or approve. I hate committees. Why do you think Webster St. Louis has sent 3 investigative committees to Thailand in 6 months to try to come up with reasons for all the problems, complaints, and lawsuits involving WUT? It’s not so much the faculty, it’s not so much the students… it’s the administration. The problem is that the investigative committee members are wined and dined by the people they were sent to investigate and then return home painting a rosy picture that doesn’t exist. So complacency sets in, and nothing ever changes… Fraud, lies, deception, and discrimination are commonplace in the WUT administration. The problem is that the team only talked to the people they were supposed to be investigating. I and most others were not invited to talk to them. It turned out to be a whitewash, although the conclusion in the report was that WUT has many problems that should be dealt with immediately. 8. In January 2015, you sent out an email to various faculty members explaining that WUT was not AACSB accredited, despite its increasing focus on MBA programs at their newer location in Bangkok. In fact, none of the Webster campuses world-wide are AACSB accredited, nor have they ever been. In response, Oliver Skatar, WUT’s new Marketing Communications Manager and former Webster student, sent out an email to the WUT community claiming that WUT is indeed a “member” of AACSB, is accredited by ACBSP, and maintains “Excellent” standing with Thailand’s Office for National Education Standards and Quality Assessment (ONESQA). Would you mind clearing up this situation, once and for all? I had believed in late 2014 that WUT lost membership in AACSB, [along with its lack of AACSB accreditation]. Membership is required to apply for accreditation. In effect, [that is] their place on the waiting list. Those schools applying for accreditation must go through a very extensive review and analysis before a yes or no is given on accreditation. I know because I helped California State University keep their AACSB accreditation when they came up for their periodic required review. Just like passing the CPA exam does not mean you are a CPA for life, AACSB accreditation is not for life. It must be renewed every few years (CPA renewal is every year; the only accounting certificate issued for life in CA is Certified Auditor, which I have). Author’s note: Webster never did, in fact, lose its “membership” in the AACSB database. For some reason, certain websites seem to list AACSB membership incompletely. That said, none of the Webster campuses have ever achieved AACSB accreditation. I’ve said elsewhere, of some 12,000 schools or colleges of business worldwide, only 711 have AACSB accreditation (accredited separately, only 182 Accounting Departments have it). Only 1,300 schools or colleges of business have membership, but that number includes the 711 who also are accredited, meaning of course that only about 600 schools are members [of AACSB] without having accreditation. WUT could only dream of being able to shine the shoes for AACSB accredited schools… i.e., not even a remote chance of accreditation for WUT. I have also contacted North Central Association which accredits the Webster University home campus regionally, and which automatically accredits all of its branches, foreign and domestic. I got an email from the [NCACS] – in response to information I provided them – saying they are considering putting Webster on probation until they clean up their Thailand campus, [which would] be a major blow to Webster all around the world. The ACBSP is also considering suspending their accreditation of Webster, but that accreditation is less than worthless [anyway], in that it actually hurts a school to be ACBSP accredited if anyone cares to look into it. So of course, [Skatar] and the WUT admin are trying to make ACBSP accreditation equivalent to AACSB, when it isn’t even close. If you have been keeping up with things, you realize that ONESQA has come up for investigation itself for negligent and deceptive practices. So, neither of these accrediting associations is worth much and may actually hurt a school. In light of the recent charges against the rector at KMITL for embezzlement, I have also convinced the Thai Ministry of Education to renew it’s interest in suspending the accreditation of WUT. There is absolutely nothing exclusive or prestigious about ACBSP accreditation. They will accredit any school that applies, even without investigating the legitimacy of the applying school. To date, they have accredited mostly community colleges in the States and schools that have the reputation of being diploma mills. Many schools that have not been granted AACSB accreditation will not apply for ACBSP accreditation because of the negative image that comes with it. Webster University Thailand never has had AACSB accrediation and probably never will. They do not come close to having the qualifications even to apply for membership in the AACSB, much less become accredited… the requirements are very strict and schools come up for re-accreditation every few years unless questions are raised in the interim. I’m told by many corporate recruiters that they recruit first and foremost at AACSB accreditated schools and colleges of business before even considering recruiting at schools or colleges that are only members. The big companies do not recruit at all at schools or colleges not associated with the AACSB. In the early 1990s, the for-profit diploma mill, University of Phoenix, applied for AACSB accreditation and was turned down flatly. They were also turned down for membership. In retaliation, they organized a similar sounding accreditation association called the Accreditation Council for Business Schools & Programs (ACBSP). Do you see how similar those acronyms are? It’s easy for potential students to get them confused, and that was what the organizers of the ACBSP intended. 9. Besides accreditation issues, what specific instances of fraud are you aware of in regard to WUT claiming certain rankings, achievements, or faculty standards? Do their qualifications line up with their marketing slogan, “an American university in Thailand” in your point of view? As someone who’s been involved at WUT over the past decade, do you think fraud has been an ongoing element of the WUT business strategy? Well, specifically… until January  WUT’s ads contained an icon implying WUT is ranked by US News and World Report in the “top 100 universities” in America. Just by posting that implication, they were committing fraud. It’s not true. When I pointed out in an email that there’s no way that’s true, either of WUT or St. Louis, they changed the icon to read “Best Colleges US News” with small print reading “Regional Universities Midwest”… which is [true] of the St. Louis campus. WUT is implying things about the Thailand campus that may be true of St. Louis but certainly, absolutely, not WUT. They’re doing the same thing implying that Forbes ranked WUT among “America’s Top Colleges” which is not true of WUT and not even of WUSTL. Through research of US News and Forbes over the past 2 years, we could prove this is false advertising, certainly of WUT if not of WUSTL, if anyone has the time to do that research. But of course they’ve now changed the wording to protect themselves against the ongoing charges of fraud, so the point may be moot. They are clever. Author’s note: Webster University’s St. Louis campus was ranked #568 out of 650 total colleges in Forbes 2014 rankings. The WUT campus is not listed anywhere on either Forbes or US News and World Report annual rankings. The fraudulent claims they were making before this January 2015 letter was published in the Bangkok Post have now been covered up. If the academic community wants to accept that, what can I do? They’ll be back to business as usual as soon as this blows over. However, I do believe we hit them harder this time than they’ve ever been hit before. Will it bring about real change? And why do we who are now on the outside really give a damn? Eventually I’ll pull out and leave the task up to others, or if everyone involved is willing to accept what they do, everyone will just have to live with it. 10. You’ve been working non-stop contacting governments, education ministries, and so forth across the world to warn them about the WUT “situation” from what I understand. In your words via email, “I have now taken several drastic actions designed to expose the WUT administration for what it is: Undereducated, inexperienced, incompetent, corrupt and deceitful.” You’ve also been offering free help to WUT students and their families for the past several weeks. In short, do you think change will come? Or is the future of higher education a blurry mess of corporate interests, corruption, and bureaucratic ineffectiveness? [It] would require a book to answer adequately, but I can answer simply: The latter. Small changes may be made for the better, but overall higher education is a mess. The University of Maryland, University College has already taken steps to privatize its operations and break away from the home campus, while keeping the name for the prestige. They want their classes to be taught by administrative-determined rules (i.e., every Economics 201 teacher on the same page on the same day) in what we oldtimers call “a class in a box”. Online “Distance Education” classes are already being taught that way, and UMUC is leading the world in DE. When the “Golden Handshake” was offered to me at age 50 by Cal State to “get rid of the overpaid teachers and replace them with more cost effective teachers”, I didn’t want to take it. I loved my job and was at the top of my game teaching graduate applied Economics classes and a few upper division undergraduate classes. Then I did the numbers and realized they were offering me a very nice tax-free retirement check every month plus free health insurance for the rest of my life. The only way that could not pay off was if I had signed the retirement papers and walked out of the building and be hit by a bus. I would have been a fool not to take it. Thousands of very qualified professors chose to take the handshake and leave. Some Berkeley professors took it and moved across the Bay to private Stanford, including Nobel Prize winners. Berkeley sank fast from its top-5 status, as did the whole system. In my case, I was replaced by 3 part-timers with Masters degrees, each taking one of the three classes I used to teach (very well). Their combined part-time salaries added up to half the full-time salary Cal State was paying me, and they didn’t have to pay any “bennies” (retirement, health insurance) for the part-timers. They saved money but the quality of education (in my opinion) went down by more than half. I understand that approximately 70% of the teaching positions in the California system are now filled by part-timers, “freeway flyers” as they’re called in California because they teach 3 courses at 3 different schools making as little as $30,000 for all 3 with no benefits. It’s happening all over the US education system as budgets are cut while football coaches and university presidents are receiving salaries ranging into the millions of dollars. Short answer then: Higher education in the US, and indeed in the entire world, is a mess. I’m glad I got in when higher education still meant something, and out when it didn’t. I draw 2 university retirement checks as well as social security. I benefited. I didn’t need the pitiful WUT salary, but I didn’t need the biggest insult I’ve ever received in my life either. That’s why I’m involved in all this. This didn’t have to be. I was doing at least an adequate job, and they had to pay me for the courses anyway. Why not give me a chance to finish and see how I did? Why fire me in the first week of the graduate term? If WUT is not shut down by St. Louis, it may be by the Thai Ministry of Education, under pressure from the investigative free press… I have contacted the Ministries of Education in India, Nepal, Myanmar, and Vietnam [etc] about the deception being carried out by WUT recruiters within their borders. I have suggested that they bar WUT recruiters from recruiting unsuspecting students within their borders using outright deception and fraud. I will be contacting several other countries in the next few days and the major universities in each country. I won’t stop until WUT gets the sordid international reputation it so justly deserves. 11. In closing, it seems rather clear that you are not afraid of the so-called “India Mafia” administrators at WUT, or are you just brave? After the January 2015 “letter” appeared in the Bangkok Post, Rector Thakur sent out a faculty-wide email insinuating legal action against any dissidents. What do you have to say to the faculty at WUT, or at any institution of higher learning, who witness ongoing fraud, corruption, threats, or other abuses? No, I am not afraid of the “India Mafia.” [They] are weasels of the first order. In my opinion they are weak and cowardly. Like all cowards, they prey on the helpless. They have preyed on, threatened, lied to, and stolen from those who they were supposed to be serving, the students and faculty at Webster University Thailand. If I have any advice for a faculty like that at WUT, I would advise them to get some backbone, stand up, stick together against small-minded tyrants who use appointed positions to bully those under them… WUT is the end of the road, the bottom of the barrel, the French Foreign Legion of higher academics. To be afraid of losing a job at WUT is like being afraid of losing a rotten tooth at the dentist. Harsh, but the real world is often harsh. I would advise the WUT faculty and any similar faculty that you can do better than hiding out in a diploma mill. I’m sorry, but I can have no sympathy for the good people on the faculty at WUT. There are better places to work (e.g., Stamford in Bangkok – not in Hua Hin – and some other Thai universities that offer their graduate programs in English… I know because I taught for one and will again soon). Charles might be correct about the problems at WUT, but he is wrong about ACBSP. ACBSP is very respectable, and has grown to accredit as many schools as AACSB (which has actually lowered its standards). In fact Webster Thailand is likely to be placed on probation or have its accreditation revoked by ACBSP. The ACBSP fields public complaints; the commissioners take complaints seriously; and they follow up. I read the end of the article where Stamford is mentioned. Stamford is part of Laureate’s network, so when one look at the management and academic team fielded by Webster, you realize they are at competitive disadvantage. Organizations such as Webster and Stamford compete in part on the quality and competency of their key personnel as well as the backing and decisions made by the parent organization. Roy is in bed with the management team. As mentioned elsewhere, he is their water boy. So yea, St Louis won’t accept him, but he is an integral part of the scam played at WUT. I want to know why Roy Avecilla is still teaching at WUT after he was denied an academic rank. It is very strange that Webster St. Louis is allowing him to continue. One wonders why! I would be most interested to get in touch with both of you – Jesse and Charles. Or you can contact me. In my observations of WUT over the last 10+ years what seems to always get missed is the link between the St Louis people and the group that provided them with all that lovely land in the ‘boondocks’. And let’s not forget the Education Ministry which has the biggest budget of all in government. Bigger than defense!